The Elder Dinner celebration, most recently held at the Jackson County Family Resource Center in Sylva, is a priority project of One Dozen Who Care, Inc. (ODWC) that fulfills our mission to honor our elders. The annual Elder Dinner program is an event that brings together racially diverse elders in the community for good food, fellowship, and fun. 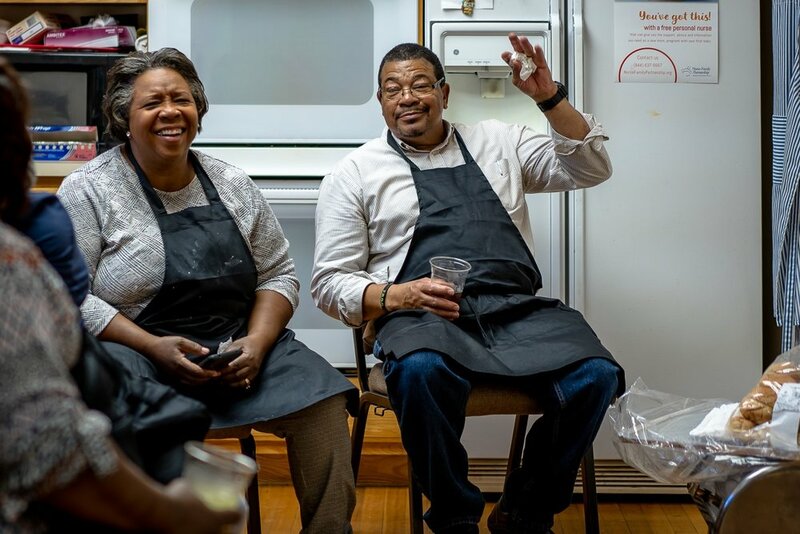 A complete dinner, usually catered by a regional African American entrepreneur, feeds 70 to 100 people from counties in far western North Carolina. Recent events have been catered and chaired by Stella Moore, the former ODWC Vice President and Finance Officer. Our latest event in 2018 was catered by Ellerna and Thomas Forney of A-Party-In-A-Box. They also provided the beautiful decor. Each year we bestow the Emma Cline Moore Award for Community Service to an older African American whose important volunteer services to the community may have been overlooked. The Community Treasure Award is also presented to a person who exemplifies outstanding devotion and commitment to the communities in our far western region. The purpose of the annual Elder Dinner is to honor elders of Far Western North Carolina for their community service. The celebration supports relationships between racially diverse older citizens and provides the opportunity to present The Emma Cline Moore Award for Community Service to one or more individuals.